Floplast uPVC Black Fascia Board is the perfect choice if you are looking for a stylish alternative to standard white. The fascia also has a woodgrain finish, which gives it an edge over other traditional styles. Fascia itself is a trim that connects to the end of the rafters and trusses to ensure that the roof is completely closed off to the elements. Fascia also needs to have a strong structure, as it supports the guttering. uPVC has become a popular material for fascia, as it is maintenance-free and lasts much longer than wood. Unlike wood, it is not susceptible to rot and is does not discolour or fade over time, which means repainting is not necessary. uPVC can be easily cleaned with soapy water, with many companies offering to do it at an affordable price. Floplast uPVC Black Fascia Board is a fantastic choice, whether you are looking to renovate your existing fascia or invest in a stylish option for your new build. Here at JJ Roofing, we have 2 thicknesses and a range of widths in stock, so you can be sure to find the right product for your roof and budget- we stock 150 to 300mm black fascia board, so make sure you select the right measurements in the drop-down lists prior to purchase. The 9mm Floplast fascia is essentially a uPVC cap, which means it requires backing board to ensure that it has the correct strength to hold the guttering in place. This makes it the perfect option if you are simply looking to renovate your existing fascia, so long as the wood that is already there is in good condition. 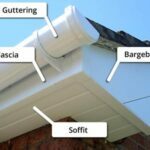 Alternatively, you can purchase 18mm uPVC fascia, which does not require backing board, as it already has a strong and rigid structure which is perfectly capable of supporting the guttering. Alongside this Floplast black fascia board, we stock any necessary joints and corners, making it easy for you to purchase everything that you need. All Floplast fascia and related products are supplied with a 20 year guarantee, which becomes valid upon registering the product on the Floplast website. We deliver fascia all over the UK, but can only supply it in 5m lengths if you have a local address. For those who live around the UK, we have a courier service that will deliver the fascia in 2.5m strips. We supply the additional joints for free.